Wham bars are perhaps the main sweet of my later childhood years, where my GCSE exams alone were perhaps fuelled by these distinctively packaged bars and even more distinctive tang the humble wham bar had! 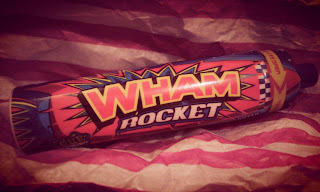 So to see the Wham Rocket bought to me a little tingle of excitement and curiosity to see how they developed a new wham product on the block! Now I love sherbet dips, when I was a good girl (and often for my granddad I was!) My granddad would walk me to the sweet shop and bought me a sherbet dip which was enjoyed immensely for hours. I want a sherbet dip-type sweet to capture that sensation all over again. You get a strawberry-esque foam dipper that you dip into the sour raspberry sherbet that has crunchy space dust mixed through. The flavours still captures all the lovable things we know and love Wham for. The intense fruity tang that explodes in the mouth with the sour hint that tinges on the lips and gently scold the tongue delightfully that it has you reaching for more. I personally would like a bit more of a sour vibe or popping of the space dust for an added dimension to the sweet but for an overall experience - it's not bad! I would however still reach for a Wham bar over this. I guess once you tasted the real thing, nothing else comes close to it! Plus this doesn't capture the chewiness that sticks to your teeth in a wonderful way! What I do like about the design feature is, the tube is re-sealable so you can save it for later and allows the longevity of the product itself, it encourages you to slow down and actually taste what it's offering! And with its bright packaging, you can't really miss it on the shelf! Its a great sweet and gives a great experience but lives in the shadow of the epic Wham Bar!